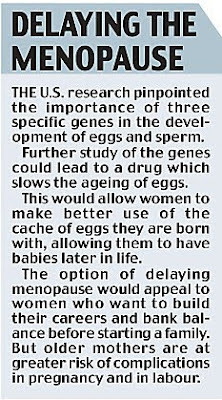 The U.S. government-funded research also offers the prospect of a 'miracle pill' which staves off the menopause, allowing women to wait longer to have a child. The double success, published in the journal Nature, raises the prospect of men and women one day 'growing' their own sperm and eggs for use in IVF treatments. hope to repeat the process with slivers of skin. The skin cells would first be exposed to a mixture which wound back their biological clocks to embryonic stem cell state, before being transformed into sperm or eggs. Starting with a person's own skin would also mean the lab-grown sperm or eggs would not be rejected by the body. The science also raises the possibility of 'male eggs' made from men's skin and 'female sperm' from women's skin. This would allow gay couples to have children genetically their own, although many scientists are sceptical about whether it is possible to create sperm from female cells, which lack the male Y chromosome. The U.S. breakthrough could unlock many of the secrets of egg and sperm production, leading to new drug treatments for infertility. Defects in sperm and egg development are the biggest cause of infertility but, because many of the key stages occur in the womb, scientists have struggled to study the process in detail. Research, believes new fertility drugs are just five years away. However, safety and ethical concerns mean that artificial sperm and eggs are much further away from use. Dr Reijo Pera said any future use of artificial eggs and sperm would have to be subject to guidelines. Scientists at Newcastle University claimed to have made sperm from embryonic stem cells earlier this year but the research paper has been retracted. Dr Allan Pacey, a Sheffield University expert in male fertility said: 'Ultimately this may help us find a cure for male infertility. Not necessarily by making sperm in the laboratory, I personally think that is unlikely, but by identifying new targets for drugs or genes that may stimulate sperm production to occur naturally. 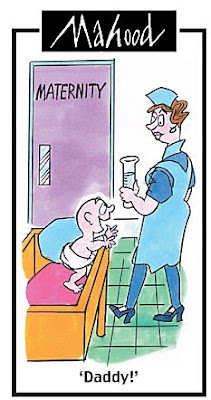 Dr Peter Saunders, of the Christian Medical Fellowship, said that IVF should be the preserve of married couples. Josephine Quintavalle, of the campaign group Comment on Reproductive Ethics, warned that any flaws in the artificial sperm or eggs could be passed on to future generations. Anthony Ozimic, of the Society for the Protection of Unborn Children, said: 'The use of artificial gametes in reproduction would distort and damage relations between family members.